Yesterday the kids and I got outside for some fun. It was pretty windy and cold, but it was still incredible to get out. After the playground fun, we went downtown to Water Street Café. Izzy and I shared a delicious cracked pepper, tomato, avocado sprinach wrap and beer cheddar soup. Yum! I am a person who needs to set goals for myself. I have also found that if I am not registered for races, I feel “lost” in my runs. Since the marathon, I haven’t really been following any type of plan other than the one called recovery. I’m pretty sure I’m recovered – since it HAS been 6 weeks! Before I go and devise a plan, I need to set some goals. Once I have the goals squared away, then I can focus on what’s important to me with a plan. Goal 1: Increase my speed – which leads to goals 2 & 3. 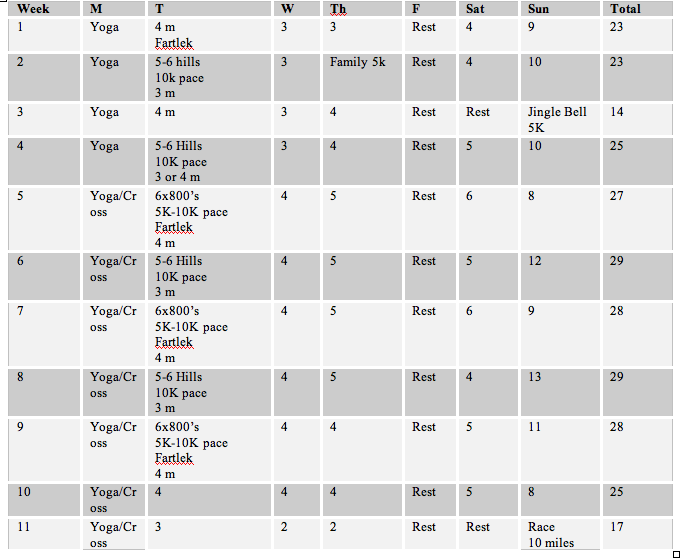 Goal 4: Complete a tri in 2012. Man I have a lot of work to do! - My last ½ marathon pace was 8:20, so I am thinking hoping both of my goals are within reach if I add in some speed work – intervals and hills. Should be easy, right? - I could get the Run Less Run Faster book and follow the plans in there, but from what I’ve heard, the plans have you running 3 days a week. I really enjoy running 5 days a week, and I’m not interested at all in decreasing this right now. - Long miles mid-week are very hard for me, mostly because of the running in the dark thing. I’d like to get those mid-week/dark run done as quickly as possible. Plus, if I’m going to chicken out and venture further away from my house, running 5 + miles in front of my house is going to get B O R I N G.
- I have scheduled races coming up, so I need to make sure I am flexible and take into account rest days prior to my races. I do love to rest for 2 days prior to a 5k. 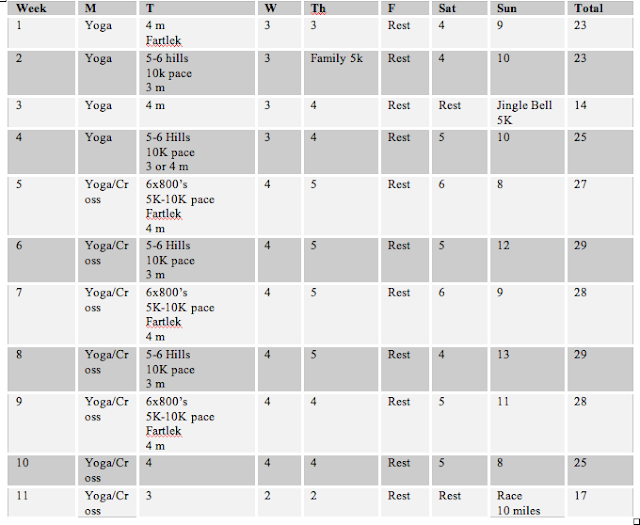 - In the past six weeks I’ve been running anywhere from 18 to 26 miles/week. I’d really like a plan that does not go under 20 miles in the beginning. - I have 11 weeks until the Mid-Winter Classic and then 8 weeks after that I have the Race the Runways ½. I'm just going to focus on the Mid-Winter Classic right now, which will give me an incredible base for Race the Runways. After quite a bit of thought, I think I’ve come up with my plan. Let’s see how it goes. - I chose hills and fartleks based on my road – I can easily pull off fartleks on my road and I have a medium sized hill less than a ½ mile from my house. - My yoga class has 4 more sessions remaining. That is why I left Monday’s as my yoga/cross training nights. When yoga is over, I may switch over to some Jillian Michaels action. I haven't even touched on the tri plan yet. I have time for that. I think. Oh, and I can I just tell you how jealous I am of Ward? Look what he bought for himself at the employee store last week. What training plans do you have in store? Do you need a plan to stay focused? Do you buy one online, use a free one, or make up your own? YIP, races certainly keep me more motivated, I'd all but given up on running before I got my marathon entry. As for doing a tri ... how exciting, that will be a fantastic goal. I have just been thinking that I need to make a plan for the rest of the year. I don't have anything to train for...but I need something to hold myself accountable to...so I will have to develop some sort of workout regimen. I'm glad to see other people are doing the same thing! Hey! You've won something on my blog -- please check it out and send me your contact info (full name, email, mailing address). Congrats, and thanks for following my journey! !